Much colder air is at our doorstep. Temperatures back toward Nashville are nearly 5° colder than we are in Cookeville. This will change the precip BACK to all snow! Heavy snow is falling at this hour and mixing with sleet at times. Temperature is 28.3° and winds are from the north at 7 mph. Roads are snow covered and very hazardous according to law enforcement. Travel is discouraged. We expect the snow to continue all night long and to have periods of very heavy snow. 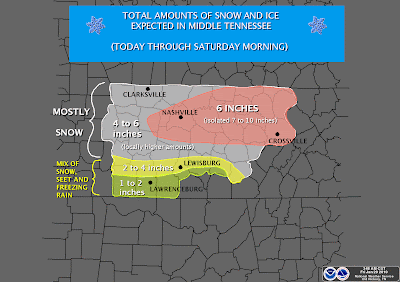 Map below is measurements as of 8 pm CST from the NWS-Nashville. Law enforcement is reporting a huge change in road conditions in the Cookeville area during the last 30 minutes. Many roads across the city and county are becoming very treacherous. Dangerous snow/sleet combination is falling and freezing to all surfaces as current temperature is 28.6°....Exercise extreme caution if you must get out tonight or in the morning. 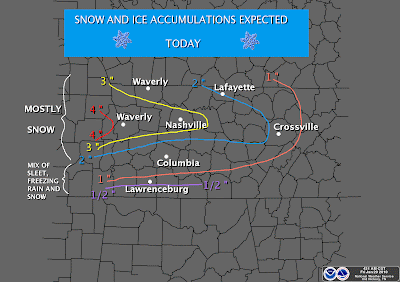 Latest map update from Nat'l Weather Service's WFO in Nashville. That, folks, is a lot of snow...no matter how you slice it! 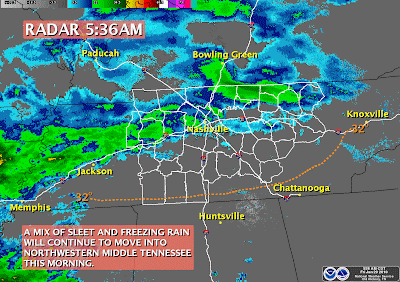 An updated WINTER STORM WARNING has just been issued by the WFO (Weather Forecast Office) in Nashville. Some highlights include the expected 4-9" of additional snowfall overnight. The forecast has gone pretty much as we expected with a little more than an inch before dusk. Heavier snow is now moving into the Nashville area and will affect us in the Upper Cumberland area of Tennessee later this evening. Much more on this continuing winter storm. 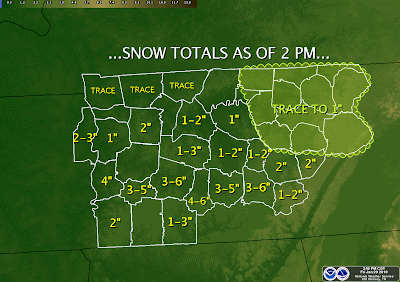 Totals (as of 2 pm) map below! Snow continuing to fall across Cookeville and all of Tennessee. We expect the snowfall to become heavier overnight as bands of move through our area. Road conditions will continue to deteriorate to the point where extreme caution is urged if travel is necessary after dark. At 2:35 pm, 1-inch of snow was measured in the Cookeville area while locations to our south around Manchester and Columbia had any where from 3-6" already. More updates, including the latest thinking on the forecast, are coming soon. 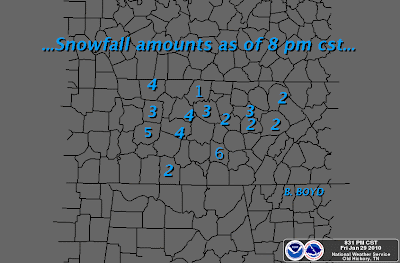 LONG LIST OF SNOW ACCUM AMOUNTS AROUND MIDDLE TN HERE. Snow is falling moderately across the county. Roads are wet and the ground is quickly turning white! The newest forecast has been issued and there are some changes. 1" to 3" today by late this afternoon (no change), but snow tonight with additional accumulations in the 4" to 8" range. Expect another 1/2" or so tomorrow. We are looking at seeing storm totals aroung 6" to 12" by Saturday afternoon. Live Cookeville Cameras @ CPC-EMA Weather Site. IMPRESSIVE ACCUMULATIONS LIKELY: It isn't very many times we get to witness a storm like this in Middle Tennessee. Post your questions in the comments section or e-mail them to me or hit me on Facebook. As the snow develops today, accumulations are likely to happen quickly. Snow chances are 100%. By dusk, we should see on the order of 2-3". Expect highs to only go to around 30° from our current reading of 27°. Overnight, things really ramp up with snow, HEAVY AT TIMES, accumulations by morning of another 4-8 inches and a low of 27°. 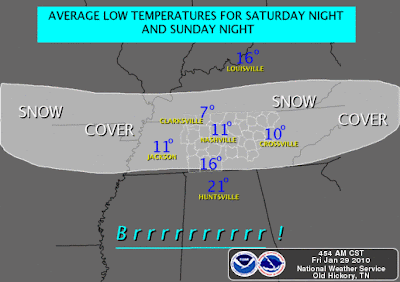 Snow chances 100% By morning, we expect to see totals range from 6-12 inches across Middle Tennessee. Higher totals will probably be to our north. For Saturday, snow continues, especially in the morning with additional accumulations, high 29°. See maps below for complete story! Each map can be clicked for larger view! As a (somewhat) new resident to this area, I am curious to know how well the local electric utilities usually handle storms like these. Are the power lines pretty robust around here? I'm seeing these reports out of Oklahoma, etc. saying that 1/4" of ice on wires can cause problems. 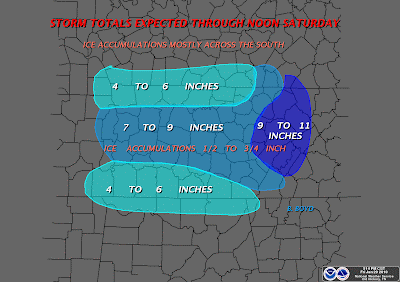 Hopefully our precip will not include much freezing rain or ice. To answer your question, I do believe the power lines are robust in this area. Additionally, the men and women who work for the Electric Department at the City of Cookeville and for Upper Cumberland & Volunteer Electric are excellent and will work all night to restore any damage we may see during this winter storm! Thanks for all the up to date info about the storm. I am curious how the installation of your new Davis Vantage Vue weather station is going. Is the installation a challenge? Michael, do you have a website where we could view reports of snow totals around the mid-state? Hey man really enjoyed you blog, you are awesome! Anon 1: Yes, the NWS will maintain a good list of totals @ weather.gov/nashville and check on nashvillewx.com for more info, too. Anon 2: Thanks for the kind words, I do enjoy this. As of 10pm we have sleet and 32 degrees in NW Cookeville, 3 inches of snow on the deck. Not a nice combination. Had to drive my wife to work in Algood, the worst roads were 12th Street by Tech and on Washington Avenue. Downtown Cookeville intersections also very slippery due to accumulated slush from all the traffic. NO sign of any salt, spray trucks or plows this evening. Guess they'll be back at it in the AM. As you know, precip. has been mainly sleet/feezing rain over the last hour or so. As you posted, temps are falling and we expect a change-over to all snow soon. True, it has been a mixture. Expecting temps to trend downward over the next several hours and an upper level low will develop and reinforce the precip. If we go back to all snow, we could see some impressive accumulations by morning. Currently at 3" in my yard.